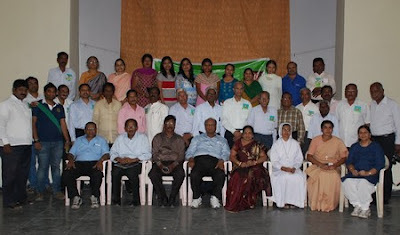 Cardijn Community International (CCI) was formally launched in Hyderabad, the capital of Andhra Pradesh in India on 19 February 2012. Hyderabad is the fourth most populous city in India with an area of 650 sq k.ms (250 sq miles). Hyderabad is also a major global centre for IT and bio-pharmaceutical industries. Around 50 former leaders of YCS, YCW and CWM participated in the one day launch program which started with a mass by Fr. Thumma Arla, a former animator of YCS and the Director of the Diocesan Pastoral Centre. The Diocesan President of CWM and the Diocesan Youth Director, Fr. Fatima Reddy also attended. Ms Elizabeth Martin, a former YCW welcomed the gathering and introduced the CCI National Leaders and the International Secretary General. CCI was formally launched by lighting the lamp by Fr. Thumma Arla and other CCI leaders present. James Sylvester, a former YCS leader and currently member of the CCI-India Volunteer Team steered the day’s program. Fr. Thumma Arla assured his support in the efforts to promote Cardijn. He emphasized on the need to ‘See-Judge-Act’ in the light of the Gospel values. Fr. Thumma appealed to the CCI to help him re-activate the Pastoral Centre and put it to proper use and expressed that CCI is always welcome to make use of the Centre. Xavier Anthony, CCI National President extended the greetings on behalf of the National Team. Ms Glynis Joseph, National Secretary stressed on the need for clear financial perspectives and self-financing. Clifford Bastian, Member of the CCI-India National Team, who is also a former YCW of Hyderabad recalled his days in the YCW here and wished the Hyderabad CCI all the best. M. J. Ruben, CCI Secretary General congratulated the Hyderabad Chapter for the launch. In his brief intervention he covered on the origin and objective of CCI and gave a general view of the functioning of the movement at the international level. All the former leaders were very excited to meet each other after 20 to 30 years and they were very jubilant that such an opportunity was created by CCI. There was a feeling of emotion clubbed with gratitude to the Cardijn movements which formed them. In their personal testimony, all those who spoke acknowledged that ‘they are what they are today only because of the formation they received through the Cardijn movements’. The forenoon session ended with lunch. Thirty-five members enthusiastically attended the post lunch planning session in which the members continued their testimonies. Two factors emerged very clearly from the testimonies, i.e. i) Cardijn is the binding factor among all of them; and ii) through the formation in Cardijn movements, they have a ‘special identity’ which is opposed to the ‘identity’ imposed by the consumer culture promoted by globalisation. All of them felt that there is a need to continue to work to restore human dignity and that they should function as a group. All of them wanted to be part of the CCI. At the concluding session, James Sylvester proposed formation of an ad-hoc team to work out modalities for regular meetings, activities, etc. and it was agreed. After consultation in small groups, a seven member team was nominated as the Coordinating Team of CCI-Hyderabad with Ms Elizabeth Martin as the Coordinator; the members of the team are: James Sylvester, I. Prakasham, Martin Michael, Patrick Fernandez, Manasa Janaki and John. An appeal was made to those who would like to be part of the team to contact the Coordinator and to take part in the next meeting. The grand launch program followed hectic preparations and contact work done by James Sylvester, Martin Michael and Ms Elizabeth Martin. The National leaders of CCI-India and the CCI Secretary-General appreciate and congratulate the efforts of the organising team in bringing Hyderabad into CCI fold.